As dog lovers, we understand the difficulty in finding good accommodation that allow dogs to have a holiday too so, we are more than happy for you to bring your dogs as long as they are well behaved. Our only rule is that we do not allow dogs to be left alone in the property unless in a crate for short periods. We may be able to offer a dog sitting service so please ask. Sand Bay is very dog friendly. The beach is a few minutes’ walk away and dogs are allowed on it all year around. Weston-Super-Mare has become more dog friendly lately and there are many bars, restaurants and cafes that allow well behaved dogs inside. 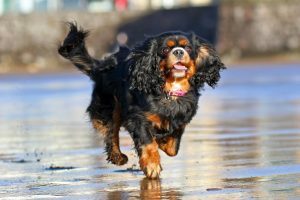 We have a tried and tested list of dog friendly establishments that are in and around the area that we regularly update. We have a large dog basket and crate if required plus throws, towels, water and food bowls, outside tap and hose which you are welcome to use. For those dogs on a raw food diet, there is plenty of freezer space. We do not make an additional charge for dogs. Whilst you are on holiday why don’t you have your pooch professionally photographed on the beach by the very friendly Martin Slade of www.K9snaps.com.